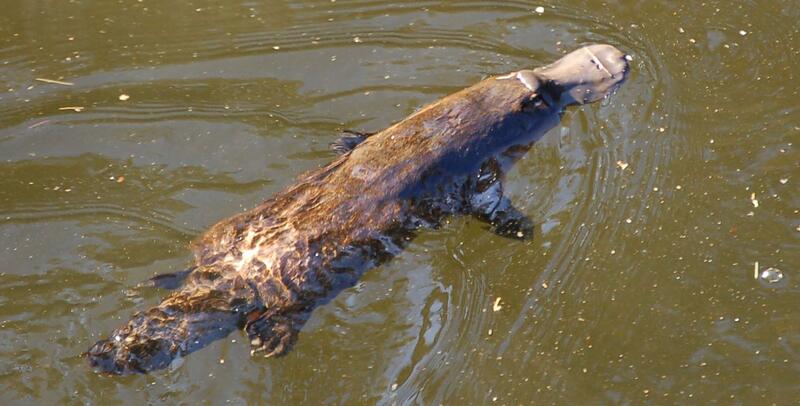 This week's Monday Mammal, the Platypus (Ornithorhynchus anatinus), comes from the fringes of the group. These awesome little aquatic oddities serve as a wonderful reminder of what it really means to be a mammal, and of our own shared evolutionary history with other mammals and even other vertebrates like the reptilians, amphibians, and fishes. I mean seriously, how many other mammals can you name that have a bill, lay eggs, or are venomous!? The class Mammalia is typically divided into two subclasses: the live-bearing Theria comprised of the vast majority of mammal species, and the subclass Prototheria comprised of the egg-laying Monotremes. Order Monotremata contains only two families: Ornithorhynchidae which includes only one living species (the platypus); and Tachyglosidae, which includes the three living echidna species. Beyond their bird-like bills (which are lined with electroreceptors to aid foraging), platypus are venomous and do lay eggs, but technically you'll never see a platypus that is both egg-laying and venomous. The reason? Well, obviously only the females lay eggs, but it turns out only males possess venom glands and spurs on their hind legs (young females also have spurs, but no venom glands). Like the panda's thumb (this one, not this one), the venomous spur is not a modified toe, but is anchored to a modified ankle bone. The spur is visible in this photo (Fig 2) and in this skeletal specimen (Fig 3) from the Melbourne Museum. Finally, it's hard to talk about all the curious details of the platypus without touching upon the problems these organisms have historically posed for creationists. For example, see this entry at SkeptiWiki and this slightly longer article at TalkOrigins.org.